Program for all academics, youth people, entrepreneurs and startups to give knowledge and expose on the importance of the social innovation. Social Innovation is one of the trending ideas and theme among the entrepreneurs to start their businesses as the world is going through the industrial revolution 4.0. 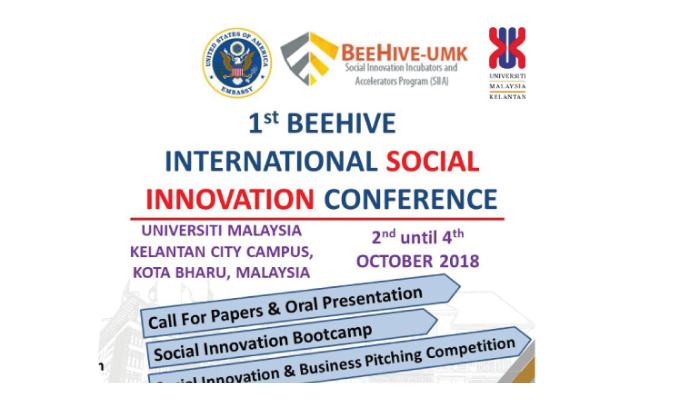 The program activities such as conference, social innovation & business pitching competition, social innovation bootcamp, social innovation forum and exhibition will make all the audiences and participants who undergo this training can feel the different atmosphere compared to other conferences. This program will be officially launched by H.E Ambassador of United States in Malaysia. ·To promote the generation of brilliant ideas among youth entrepreneurs. · To foster a spirit of cooperation and mutual assistance among youth entrepreneurs. · To establish new business networks among youth entrepreneurs. Expolore about the latest information and current issues in social innovation. Meet and create new business networks among the entrepreneurs, academicians, researchers, start-ups and the universities. Have a chance to win the prizes up to MYR 10,000 in Social Innovation Competition and Business Pitching Competition. Social Innovation Bootcamp will be trained by certificates entrepreneurial coaches from Wow Labs, France with the modules from Babson College, USA and Wow Labs, France. Open to all academicians, youth people, entrepreneurs and startups that are 18 years and above. Able to participate in English speaking program and come to the program venue. Register the program before 26th September 2018. Visit our website and follow the conference menu on the website. Our committee members will contact you for further formalities after the registration form had been filled up.